How to do Japanese Braiding, also called Kumihimo the EASY WAY! 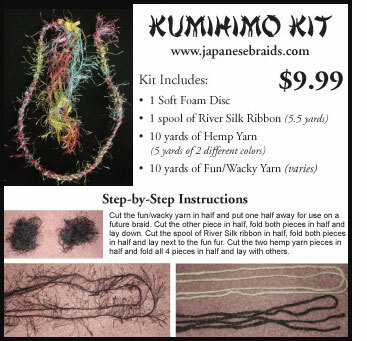 Japanese Braiding (Kumihimo) Made Easy! After discovering a wonderful Kumihimo (Japanese braiding) disc, I wondered how our River Silks ribbon would look braided and had to try it. The braids come out very tight, intricate and beautiful. I used ribbon from the Heirloom collection (pastel colors). Click on the picture (to the right) to get a close-up view. Then I began experimenting with various fibers (alpaca, hemp, string, wool, etc.). 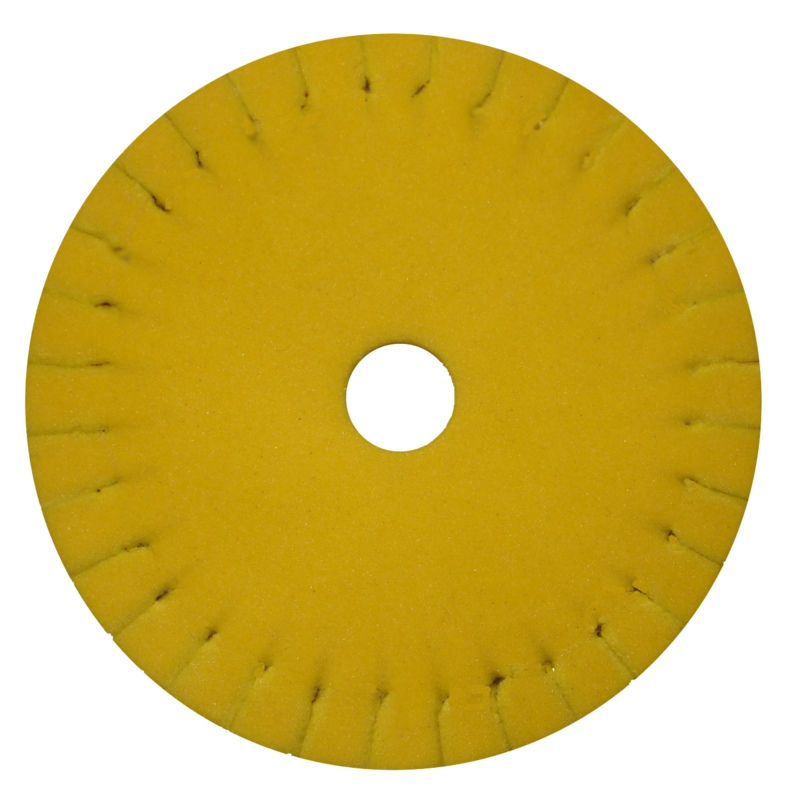 I also tested other kumihimo discs (round, square, with numbers and without, stiff) before deciding this was the one I wanted to include in my kits. 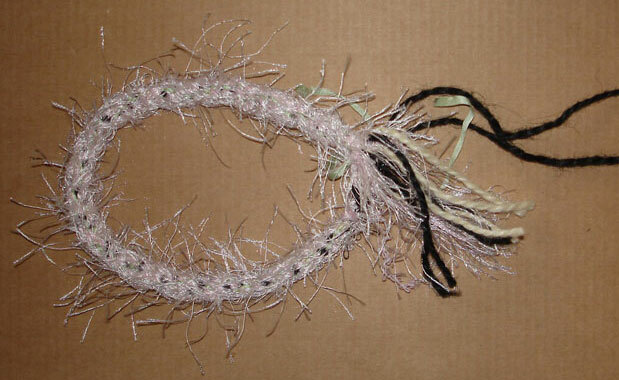 It holds the strands firmly, but gently so you can braid with fragile fibers like Alpaca. We've included some Alpaca yarn in our Kumihimo Refill Pack. 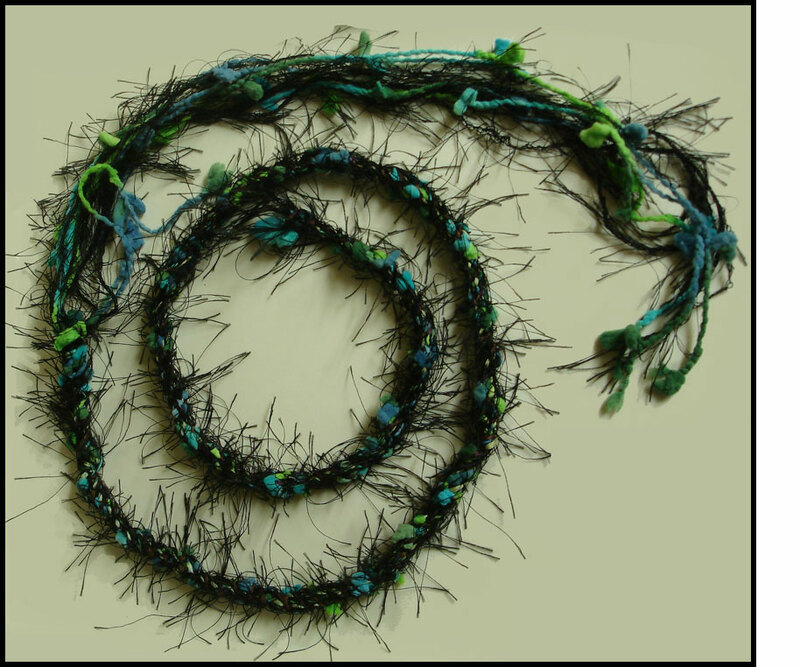 No matter what the length was (4 feet or 8 feet), I found the River Silk Ribbon strands the easiest to separate and untangle by simply combing my hand down as I went. And since the River Silk ribbon is so durable, it stayed intact and perfect throughout the whole braid. After trying weights I decided I preferred to braid without them (they made my hands tired). You will love these kits. There are different combinations so you can pick what you want. We bought a huge assortment of the wild and crazy fiber furs so you won't know for sure which one you're getting till it arrives, but I'm sure you will love it. 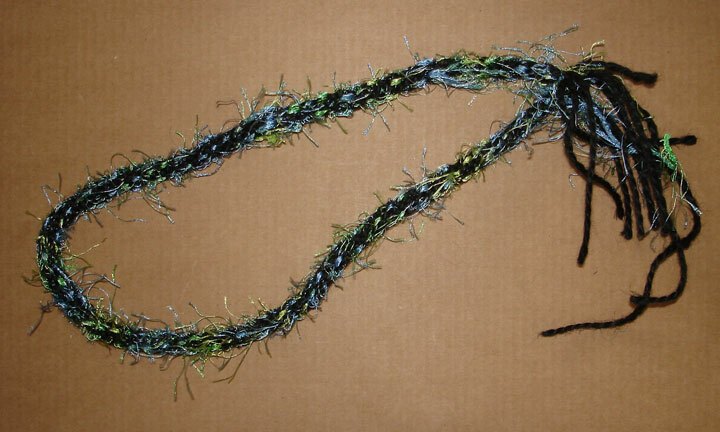 A braid made of silk will look quite different from one made of hemp, cotton or wool. 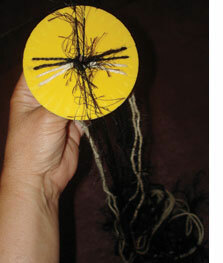 The number of strands and the fiber you choose affects how thick the braid will be. The pattern of the braid is determined by how you arrange the colors, the sequence used, and how many strands pass through at once. Even a simple structure can produce a tremendous variety of different designs depending on what colors you choose and how they are arranged. The fancy fiber stretches a lot more than the silk ribbon so you don't have to cut them as long. The longest strands I worked with were 99 inches long. I found them a little hard to work with in the beginning until I'd braided quite a bit and only recommend cutting strands that long if you need a long braid. I prefer to work with a 49.5 inch length (one silk ribbon spool (5.5 yards) cut into 4 equal pieces). 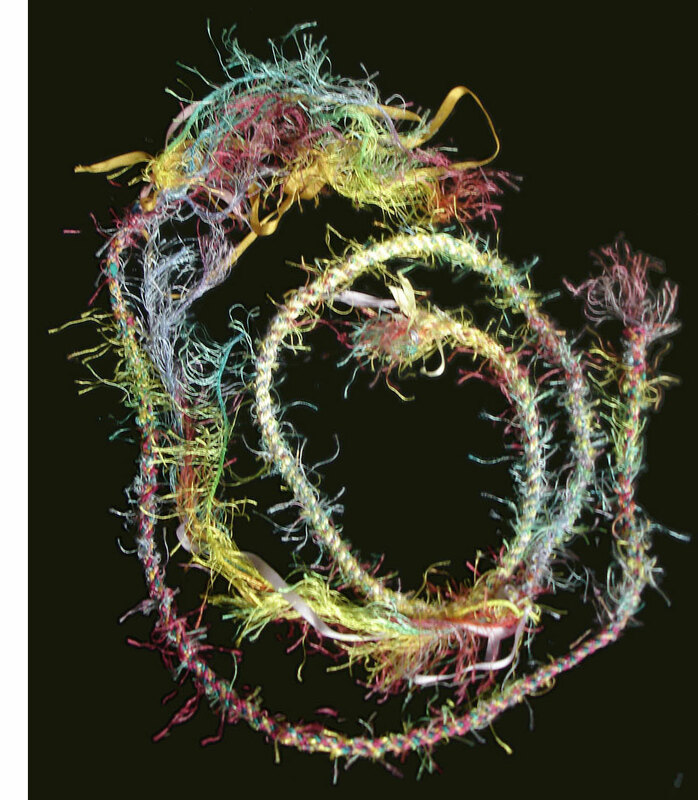 The silk ribbons are easy to separate/untangle, but the wild fibers tangle easily. I prefer to use only one fancy/wild fiber (folded in half of course) per braid. If you comb your finger through each time you complete a braid cycle you will keep your braid tangle-free. Click here for some detailed braiding instructions in case you lose the ones the come with the kit or just want to see how it is done. We introduced this kit at the Denver Quilt, Craft & Sewing Festival, and they flew off the shelf when people saw how beautiful our finished braids were. 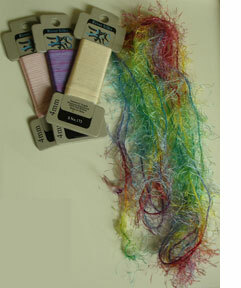 This kit includes a nice assortment of different fibers that look great together. We think you will be pleased with your finished braid. Hemp may be known for its strength and durability, but its comfort and style are second to none. Hemp also holds its shape, stretching less than any other natural fiber. The porous nature of hemp allows allows it to "breathe," so it is cool in warm weather. Conversely, air which is trapped in the fibers is warmed by the body, making hemp garments naturally warm in cooler weather. 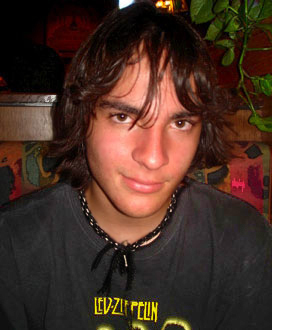 Nick is wearing a braid made with all Black plus one Natural hemp strand. 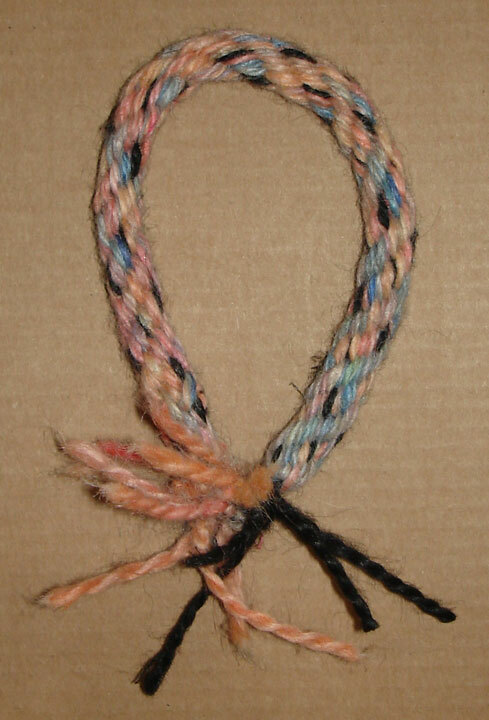 The wrist band braid on the right includes two Natural hemp strands. I like to include Hemp in my braids when I want a little thicker braid. 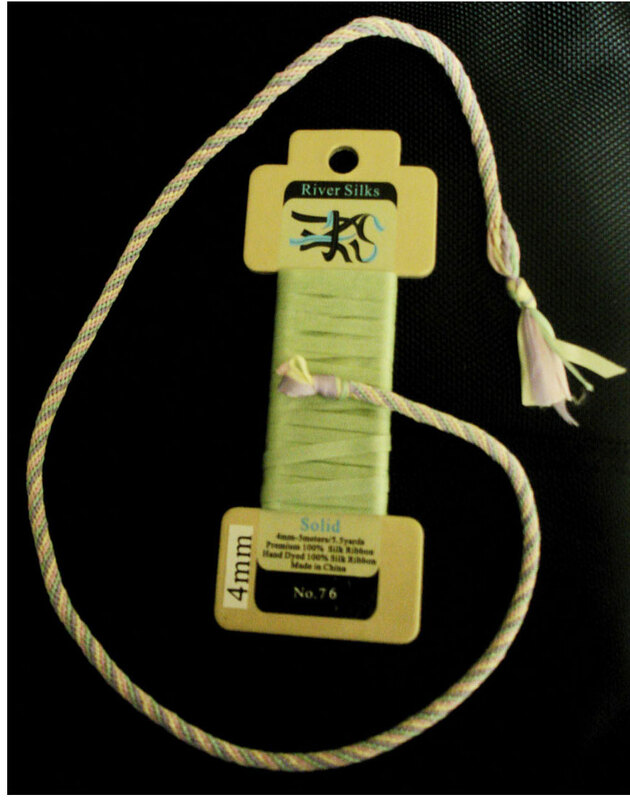 It is easy to braid with and will untangle pretty easily, especially when combined with some of our River Silk Ribbons. Hemp may be known for its strength and durability, but its comfort and style are second to none. Hemp also holds its shape, stretching less than any other natural fiber. The porous nature of hemp allows allows it to "breathe," so it is cool in warm weather. Conversely, air which is trapped in the fibers is warmed by the body, making hemp garments naturally warm in cooler weather. Hemp fabrics soften and become more beautiful and lustrous with washing. 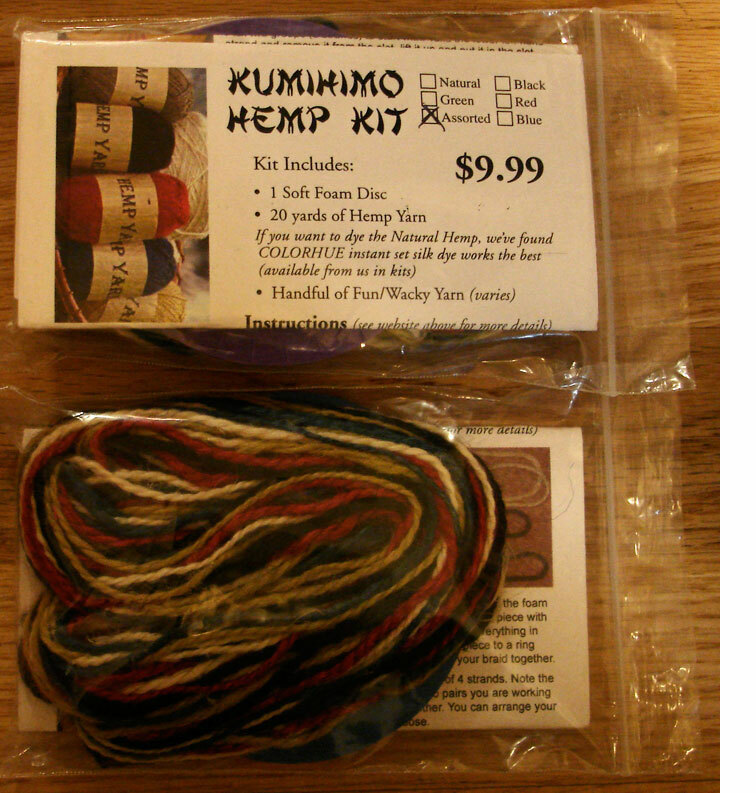 Our Hemp yarn is hard to find so we've included all of the colors in our Kumihimo Refill Pack. River Silks manufactures premium 100% silk ribbon. The silk ribbon is woven to strict specifications and hand dyed in Suzhou, China, the ancient capital of the Silk Road. The ribbon has a barely perceptible selvedge which gives them incredible durability. This silk ribbon is not fragile and likely to run, ravel or fray as many silk ribbons do. 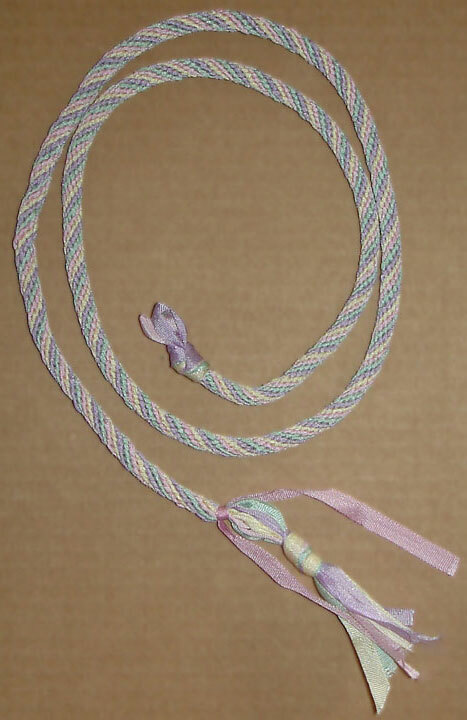 You will find our ribbons are perfect for braiding. Pastels Medium Dark Surprise Me! COLORHUE dyes are primarily designed for use with silk. They do not require any additives, heat applications or time setting procedures. They are water soluable and color fast. These dyes strike in just a few seconds, making dyeing tasks much easier and faster. COLORHUE dyes can be used successfully for rayon , wool, linen, hemp, soy and bamboo fibers. 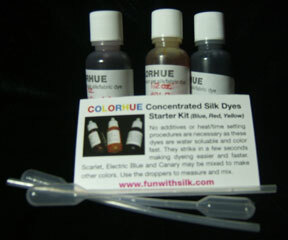 Many colors can be acheived by mixing the 3 primary colors in the dyes sampler kit. The concentrated dyes are merely diluted with water to lessen their color intensity. Hemp may be known for its strength and durability, but its comfort and style are second to none. Hemp also holds its shape, stretching less than any other natural fiber. Due to its porous nature, hemp is very water absorbent and will retain its color when dyed. This porous nature allows hemp to "breathe," so it is cool in warm weather. Conversely, air which is trapped in the fibers is warmed by the body, making hemp garments naturally warm in cooler weather. Hemp fabrics soften and become more beautiful and lustrous with washing. 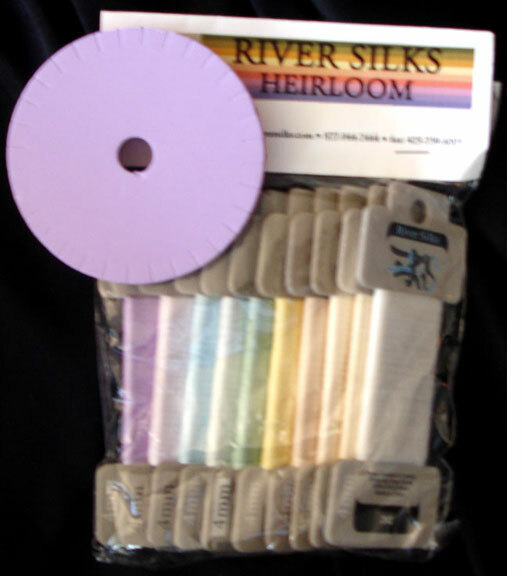 River Silks manufactures premium 100% silk ribbon. The silk ribbon is woven to strict specifications and hand dyed in Suzhou, China, the ancient capital of the Silk Road. The ribbon has a barely perceptible selvedge which gives them incredible durability. Our silk ribbon is not fragile and likely to run, ravel or fray as many silk ribbons do. 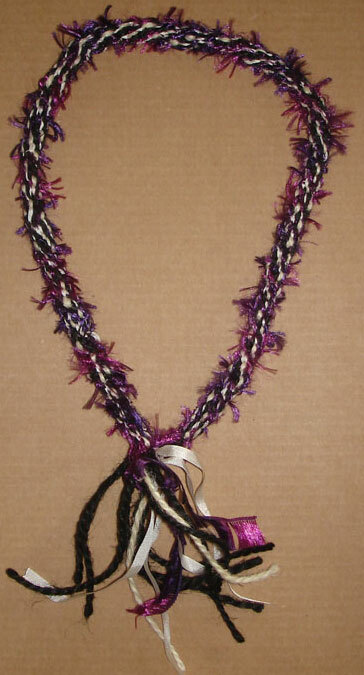 You will find our ribbons are perfect for braiding. This particular set of colors will make several small beautiful, intricate, pastel silk braids or a few larger braids if you use more strands. This kit would be perfect to make a silk ribbon handle for a silk purse.